HAMLET, a protein in human breastmilk, re-sensitises antibiotic-resistant bacteria to old antibiotics. The Human Alpha-lactalbumin Made LEthal to Tumour cells protein, or HAMLET for short, is a protein complex found at high levels in human breast milk made up of the protein alpha-lactalbumin and a fatty acid, oleic acid. Its ability to make antibiotic-resistance bacteria sensitive to old antibiotics again could solve the problem of increasing antibiotic resistance in bacteria, according to a paper published in PLoS ONE by researchers from the University at Buffalo, New York. HAMLET binds to a pump on the surfaces of bacteria, causing a change in the concentration of hydrogen and calcium ions inside the cells, which cause them to die. It directly kills bugs that usually cause nose and throat infections and sensitises other bugs to antibiotics so that even low levels of the drug are able to kill off the infection. More interesting is HAMLET's ability to re-sensitise bacteria to antibiotics to which they have previously become resistant. In tests, HAMLET re-sensitised MRSA (methicillin-resistant Staphylococcus aureus) to methicillin again. Antibiotic-resistant bacteria growing in the noses of mice were treated either with an antibiotic alone, or a combination of the same antibiotic together with HAMLET. After 24 hours, the mice given antibiotics alone remained infected. However, those treated with the single dose of HAMLET and antibiotics were infection free. 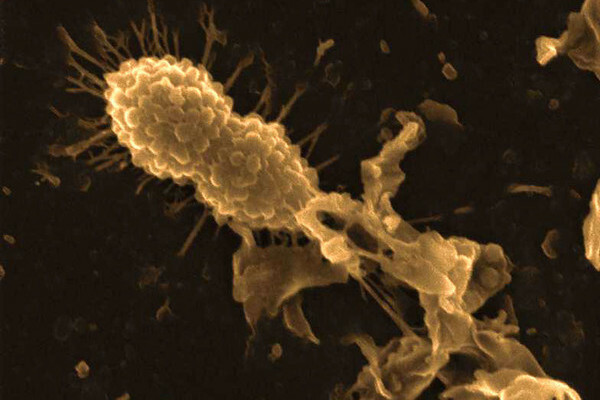 The researchers also found that bacteria did not develop resistance to HAMLET in the lab, suggesting great potential for HAMLET to be used as a treatment. "We think that HAMLET has chosen a target in the bacteria that they can't get rid of or change in any way," says Anders Hakansson, leader of the team in New York. As HAMLET is a natural product from human sources, it is less likely to cause an adverse reaction when administered as a treatment. Although, as Hakanasson observes, "there will be safety issues with infections in donated milk which must be considered." This can be overcome by looking for other ways to create of HAMLET. "We can make the same complex with cows' milk alpha-lactalbumin. The protein component we can get from cows' milk and oleic acid is very easily available commercially. You can mix those two together to make a complex that does the same thing." Researchers hope that HAMLET can be developed into a drug that could be used either on its own or in combination with other antibiotics to treat infections. "The novelty of this is that (HAMLET) is a sensitiser rather than a new antibiotic." And, as far as Hakansson knows, there is nothing else quite like this available on the market. Hakansson and his team hope that this will shift the focus of antibiotic research from making new antibiotics to discovering molecules like HAMLET which sensitise bacteria to antibiotics.